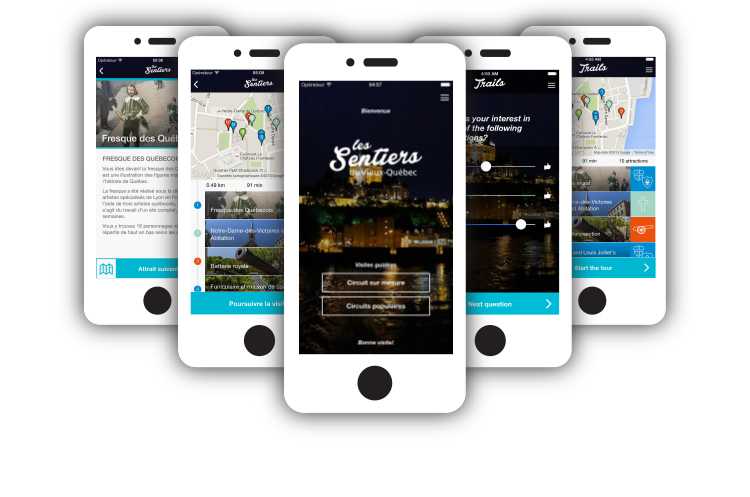 Trails of Old Quebec is a custom-made guided tour mobile app for Old Quebec. Users need only answer a few short questions about how much time they have, what they like, and their level of mobility. Then, they can enjoy an visit of Old Quebec that's custom-made for them. The app takes into account, among other things, your degree of interest for history, taking nice pictures, and shopping. Those interests are compiled to create an experience that is as close as possible to a private guided tour, without spending the amount required. In fact, the app is free, and available through the App Store and Google Play. Maps, itineraries, geo-locations, off-line mode and historical content are available to the user. And, since you can pre-download your content via WiFi, you are able to walk around Old Quebec without using any data connection.